Goodwell, Okla.—Anchor D Arena was bursting with Aggie pride Thursday evening, as the Panhandle State men's basketball team took down their second nationally-ranked SAC opponent with a big win over No. 24 John Brown University (71-69). After trailing by 18 points (45-27) at halftime, the Aggies put in a resolved second-half effort that produced a 23 percent increase in shooting (57.69%) and brought a surge of energy on the court and in the crowd. Khallid Edwards and Breiman Alexander hit on four consecutive shots in the opening minutes after the break to edge the Aggies down to a single-digit deficit (47-38) for the first time since the ten-minute mark in the first period. An amped-up Aggie defense held the Golden Eagles scoreless for a full four-minute stretch, allowing Panhandle to pull into a four-point lead (60-56) with 5:46 left in the game. A crucial three from Thomas Ellis off the bench sparked spirits and shifted the Aggies into their largest lead of the game (67-60) with just over three minutes remaining. Solid rebounding from Alan Hodge, Jr. along with steady shots from Ellis at the free throw line left the Aggies holding a four-point advantage with 20 seconds left on the clock. JBU sunk a clutch shot beyond the arc and took a foul and timeout to stop the clock at 00:09. Alexander went 1-1 at the line (71-69) with the second shot rebounded by the Golden Eagles. 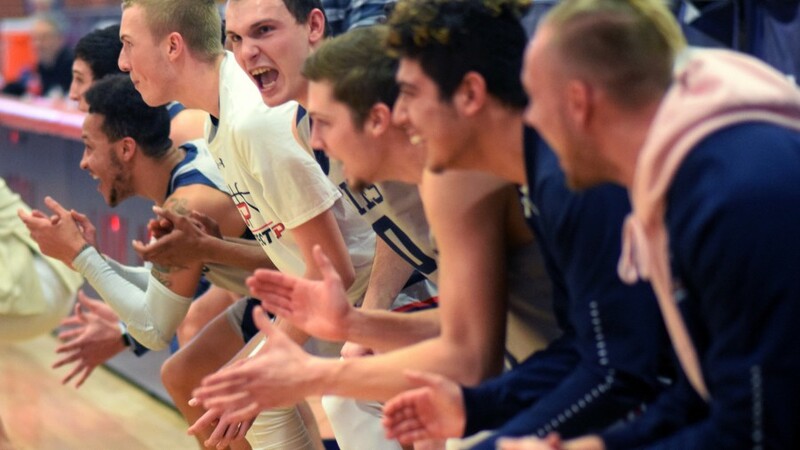 Fans held their breath as a last-second three attempt by JBU fell short, securing the two-point home court victory for Panhandle State. With the win, the Aggies improve to 9-7 on the season and hold the sixth slot in conference standings with a 4-6 SAC record. An elated Coach Coombs commented after the game, "I am so happy for this win, but I am even more proud of how these guys responded. Our halftime message was positive and I really felt that we put our character on display in the second half. It could have gone either way and we made it a game." While Coombs did not feel his team defended poorly in the first half, their efforts were outmatched 19-9 at the boards in the first 20 minutes of play. After the break, the Aggies evened up rebounds with their opponents 14-14, and had zero second-half turnovers with three steals. Senior Alan Hodge, Jr. led the team with seven rebounds on the night, followed by Baris Ulker with four. Ulker and Khallid Edwards were credited with two and three takeaways respectively for the Aggies' five steals in the game. Senior Breiman Alexander held the game-high in scoring with 29 points; he landed four shots from three-point range and went 9-11 at the line. Edwards posted the second-highest points for Panhandle with 14 and led the team in assists with five. Coach Coombs also spoke specifically on player performance adding, "Our seniors stepped up big time and played like seniors. Bre [Alexander] made some high-level shots to get us back in the game, and Hodge defended their best player really well all night." He continued, "TC [Ellis] was big for us and gave us a big boost off the bench; he defended at a high-level and hit a massive three at a crucial time. Khallid [Edwards] also did a great job guarding and running our team; he is the coach on the floor and does a great job of finding the great players around him." Coombs went on to say, "Baris [Ulker] and Jaedon [Whitfield] did a fantastic job of rebounding, especially in the second half. This was truly a team win. Everyone who played contributed and our bench was in the game, being loud and talking up their team throughout the entire game." He concluded by noting, "It also helped having such a great crowd in the stands. They were right there with us the whole night." Aggie fans can catch the men's basketball team back in action at Anchor D Arena on Saturday, Jan. 19 as they take on another Sooner Athletic Conference team with a matchup against Bacone College at 4 p.m. The Aggie women tip-off against the Warriors at 2 p.m. and both games will offer live stats and video streaming with links available online at opsuaggies.com.